Bucked Off Your Stick Figure Family decals. This vinyl decal sports a trusty and frisky steed tossing that perfect family through the air with vigor. It is just the thing for horse lovers everywhere. And as horse lovers know, there are days when your horse is a better friend than most of the people you know. This particular horse shows you how it's done. You can use the decal on any clean, flat surface, though most people tend to use it on a car window. It is made of high quality vinyl that should last for five or more years. It is 6 inches wide by 5 inches tall so people are going to be able to see it and laugh their socks off. 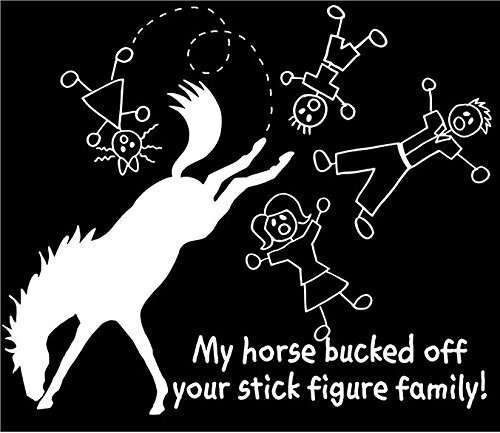 Bucked Off Your Stick Figure Family decal and send those stick figures flying, click here.